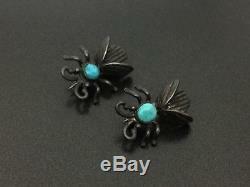 Vintage Southwestern Sterling Silver Turquoise Bug Pin Brooch Pair. All items, unless stated otherwise, are previously loved and used. Therefore, they inevitably have scratches and slight imperfection (not brand new). We could miss dents/cracks and such imperfections are not included in the description wordings, simply because we didn't notice. Please refer to pictures for condition as it is exactly what you will get. We describe the items to the best of our ability, but please note: size and weight are approximate only. "Vintage" is based on look and feel of the item. It could be way older (earlier than 1930's), or it could be newer (later than 1980's or 1990's). Sometimes sterling jewelry could be chrome plated. It is still sterling if it is marked so. We tested all our jewelries. We are not experts on stones. Potential buyers please refer to pictures on type and quality of stones and make your best judgement. Our description is just a guidance. We name an item "southwestern" if it is of southwestern style. It applies to items origins of which we are not completely sure. In most cases, they are from tribes such as Navajo, Zuni, Hopi, etc. We name an item "sterling" if it is tested to be at least coin (90%) silver. No return on international sales unless item is completely misrepresented. Please check out my other items. The item "Vintage Southwestern Sterling Silver Turquoise Bug Pin Brooch Pair" is in sale since Tuesday, April 24, 2018. This item is in the category "Jewelry & Watches\Vintage & Antique Jewelry\Vintage Ethnic/Regional/Tribal\Southwestern". The seller is "sixteenth-alley" and is located in Milpitas, California. This item can be shipped worldwide.